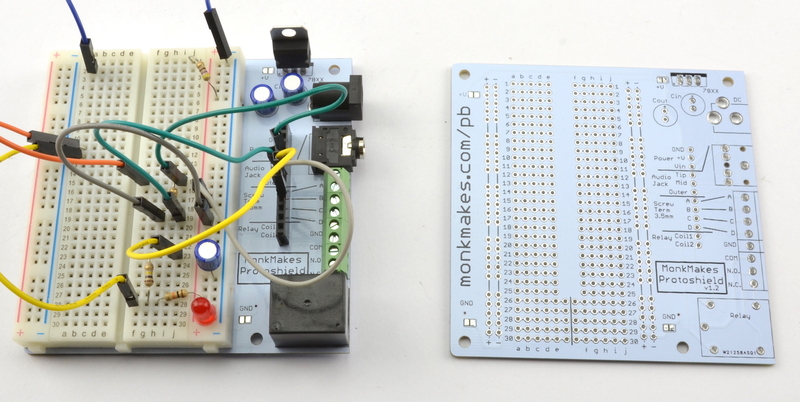 After its successful KickStarter Campaign the MonkMakes Protoboard is now available as a kit. 2. Adding component footprints on the side of the board for connectors and a relay that don’t fit straight onto breadboard. These are unpopulated so just add the parts you need for a particular project. 4. Add longer breadboard rows at the bottom of the board for modules that use 2×4 or 2×5 pins such as the ESP01 or NRF24 modules. As well as being a good place to solder up the final design, I have also found it useful to stick a solderless breadboard onto one protoboard with a full set of components to be used for the solderless breadboard phase of the project. That way I can prototype without the need for any soldering, using jumper wires to connect to the screw terminals, audio jack etc. Here is what I did when I was making an energy monitor for my solar panels using a Spark Core. First off, I turned one of the MonkMakes Protoboards into a solderless prototyping board by soldering on all the connectors and sticking a self-adhesive solderless breadboard onto the protoboard. This board can then be used each time I have a new design to prototype. The next step is to build the design. The audio jack is used to connect the CT sensor that measure the current and two screw terminals are connected to an AC transformer. Once it was all working, I just transferred the solderless breadboard design to a second protoboard to make the design more permanent. This is super-easy to do because everything is in the same place and could just be transferred from the solderless build to the soldered protoboard. This board is ideal for use with any project that you could start with a 400 point solderless breadboard. So that means pretty much any project. 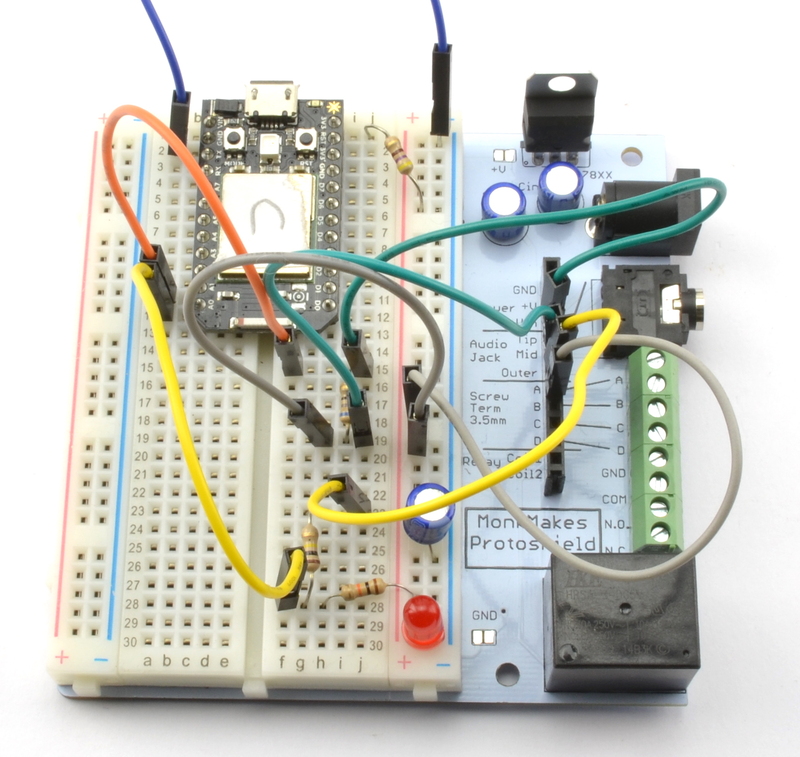 Its great for projects that use an Arduino Pro Mini or even for making an off-board Arduino. 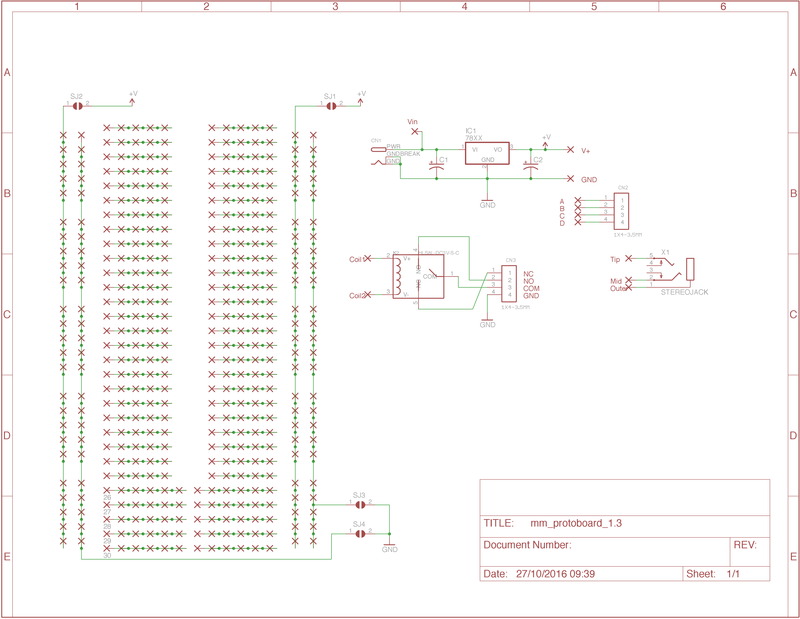 Here is the schematic for the board, so you can see just how the power supply, relay etc are connected. Buying components can often be quite time consuming and annoying. So here is a table for product codes for some popular suppliers where you can get the ‘side components’. If you find other sources, please comment below and I’ll add them in. 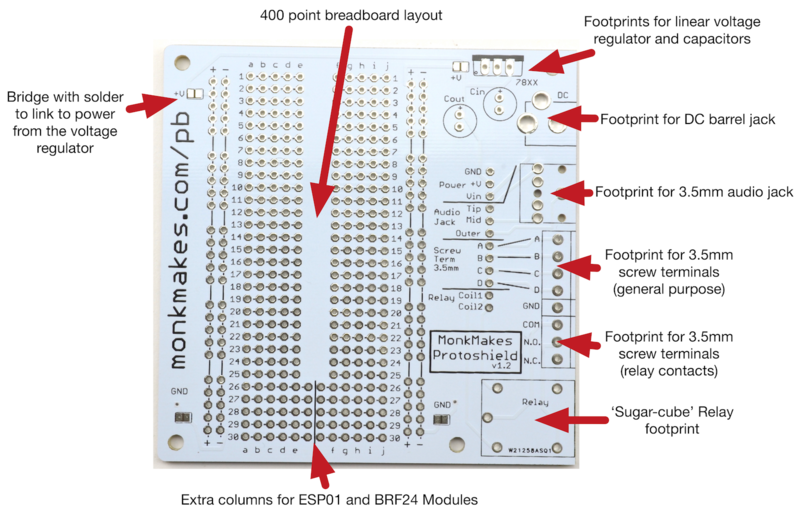 When it’s time to replenish your stock of MonkMakes Protoboard you can either get another kit like this, or you can buy a 5 pack of boards or twin pack of side components. I am one of your kickstarter backers 🙂 Do you use this in one of your books? I have soldered up a complete board with the components as you have suggested but need some ideas/guidance on what to do/try next. It would also be nice to print on the board the value of the capacitors as well. I found the ESP8266 pins very handy. That’s definitely a nice touch. It may have been nice to continue those pins all way way down the center of the board. So that you could install more than just the one ESP8266 on the board.